One of the perceived social ills inspiring Prohibition was the owning of bars by brewers. To the Anti-Saloon League and like-minded groups, this arrangement promoted alcoholism. They made the case so effectively that, even after Prohibition was lifted in 1933, most states insisted on keeping alcohol makers far away from alcohol sellers. The favored solution: a three-tier distribution system requiring manufacturers to sell to wholesalers, and wholesalers to sell to retailers. That structure is still in place in most states today. But a closely watched federal court case filed in Seattle is now challenging the three-tier regime as outdated and anticompetitive. In 2006 Issaquah (Wash.)-based club store Costco Wholesale (COST) won an antitrust lawsuit challenging its home state’s three-level arrangement. The state then appealed, arguing that the 21st Amendment ending Prohibition gave states the authority over alcohol regulation. The Ninth Circuit Court of Appeals is expected to rule on the case soon — a decision that could have widespread ramifications for every group with a stake in the beer and wine industry. Brewers and wineries nationwide could eventually gain the power to sell their products directly to retailers. Distributors and state tax collectors, meanwhile, could lose substantial revenues. The Costco case could “radically change the rules of the game,” says George Hancock, chairman of Pyramid Breweries, a craft beer brewer in Seattle. Not so in Los Angeles. There, increased demand generates little new supply. Even within zoning rules, it’s hard to get permission to build. When a local developer bought three small 1920s duplexes on our block, planning to replace them with a big condo building, neighbors campaigned to stop the proj­ect. The city declared the charming but architecturally undistinguished buildings historic landmarks, blocking demolition for a year. The developer gave up, leaving the neighborhood’s landscape — and its housing supply — unchanged. 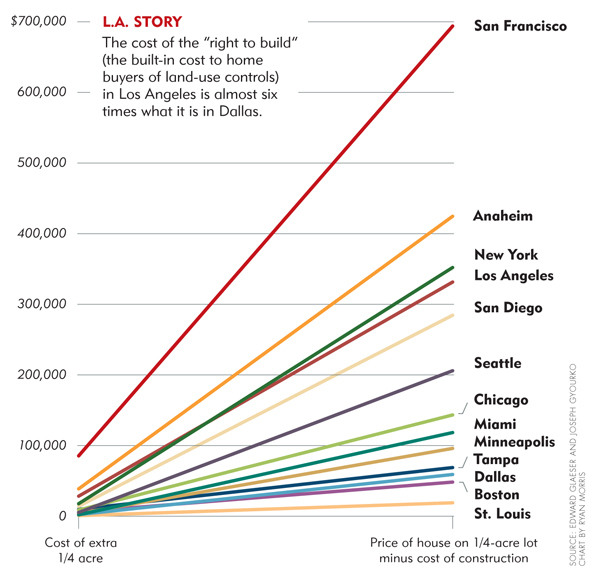 In Los Angeles, when demand for housing increases, prices rise. 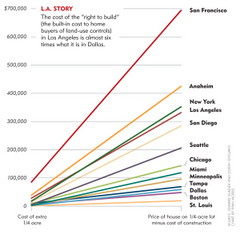 Dallas and Los Angeles represent two distinct models for successful American cities, which both reflect and reinforce different cultural and political attitudes. One model fosters a family-oriented, middle-class lifestyle — the proverbial home-centered “balanced life.” The other rewards highly productive, work-driven people with a yen for stimulating public activities, for arts venues, world-class universities, luxury shopping, restaurants that aren’t kid-friendly. One makes room for a wide range of incomes, offering most working people a comfortable life. The other, over time, becomes an enclave for the rich. Since day-to-day experience shapes people’s sense of what is typical and normal, these differences in turn lead to contrasting perceptions of economic and social reality. It’s easy to believe the middle class is vanishing when you live in Los Angeles, much harder in Dallas. These differences also reinforce different norms and values — different ideas of what it means to live a good life. Real estate may be as important as religion in explaining the infamous gap between red and blue states. The research is painting a broad new understanding of how the mind works. Contrary to the conventional notion that people absorb information in a deliberate manner, the studies show that the brain uses subconscious “rules of thumb” that can bias it into thinking that false information is true. Clever manipulators can take advantage of this tendency. Furthermore, a new experiment by Kimberlee Weaver at Virginia Polytechnic Institute and others shows that hearing the same thing over and over again from one source can have the same effect as hearing that thing from many different people — the brain gets tricked into thinking it has heard a piece of information from multiple, independent sources, even when it has not. Weaver’s study was published this year in the Journal of Personality and Social Psychology. The experiments by Weaver, Schwarz and others illustrate another basic property of the mind — it is not good at remembering when and where a person first learned something. People are not good at keeping track of which information came from credible sources and which came from less trustworthy ones, or even remembering that some information came from the same untrustworthy source over and over again. Even if a person recognizes which sources are credible and which are not, repeated assertions and denials can have the effect of making the information more accessible in memory and thereby making it feel true, said Schwarz. Experiments by Ruth Mayo, a cognitive social psychologist at Hebrew University in Jerusalem, also found that for a substantial chunk of people, the “negation tag” of a denial falls off with time. Mayo’s findings were published in the Journal of Experimental Social Psychology in 2004. “If someone says, ‘I did not harass her,’ I associate the idea of harassment with this person,” said Mayo, explaining why people who are accused of something but are later proved innocent find their reputations remain tarnished. “Even if he is innocent, this is what is activated when I hear this person’s name again. Mayo found that rather than deny a false claim, it is better to make a completely new assertion that makes no reference to the original myth. Rather than say, as Sen. Mary Landrieu (D-La.) recently did during a marathon congressional debate, that “Saddam Hussein did not attack the United States; Osama bin Laden did,” Mayo said it would be better to say something like, “Osama bin Laden was the only person responsible for the Sept. 11 attacks” — and not mention Hussein at all. The psychologist acknowledged that such a statement might not be entirely accurate — issuing a denial or keeping silent are sometimes the only real options. So is silence the best way to deal with myths? Unfortunately, the answer to that question also seems to be no. Myth-busters, in other words, have the odds against them. 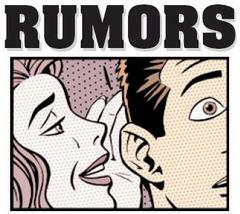 Allport and Postman called their most far-reaching assertion “the basic law of rumor.” It declared that rumor strength (R) will vary with the importance of the subject to the individual concerned (i) times the ambiguity of the evidence pertaining to the topic at hand (a), or R ? i × a.
There’s no two ways about it — this car is ugly as sin and as rough as a shipping pallet. But that doesn’t matter because it gets 95 mpg. Its owner, known only as “basjoos,” says he spent $400 building “Aerocivic” in his yard using things you can get at hardware and art supply stores. That pretty much invalidates auto industry arguments about it being difficult and costly to build super fuel-efficient cars. It also makes him a contender for the Automotive X-Prize, a $10 million challenge to build the first 100-mpg car. According to a thread over at Ecomodder.com, basjoos started with a 1992 Honda Civic CX that already got about 50 mpg or so. He used aluminum, Coroplast and Lexan to improve the aerodynamics of the car, dropping the drag coefficient from 0.34 to 0.17. 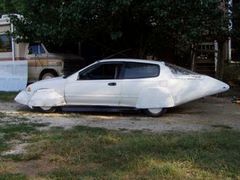 Although the car looks like it would be pushed all over the place, if not blow apart entirely, in a stiff breeze, basjoos claims it’s smooth to 90 mph and will top 100 mph. He says it gets 95 mpg up to 65 mph before fuel economy begins to fall as speed increases. Granted, the Civic is a lightweight car with a small engine and a lot of the improvement in basjoos’ fuel economy can be attributed to his hypermiler driving style. But AeroCivic is still an impressive accomplishment, and Ron Cogan of Green Car Journal and GreenCar.com tells us automakers will be building cars a lot like it in order to meet the new 35 mpg fuel economy standard. Dr. Paresh Dandona and colleagues from Kaleida Health in Buffalo, New York looked at inflammation and oxidative stress, which occurs when levels of normal byproducts of metabolism known as free radicals exceed the body’s ability to neutralize them. In previous research they found that obese individuals have higher levels of oxidative stress and inflammation than normal-weight individuals. They also demonstrated that eating a high-fat, high-carb meal increased oxidative stress and inflammation in normal-weight people. To test whether these increases might be greater in obese people, Dandona and his team had 10 normal-weight and 8 obese people eat a 1,800-calorie meal consisting of a large hamburger, a large serving of fries, a large cola, and a slice of apple pie. Both groups showed increases in oxidative stress two hours after eating the meal. By three hours, oxidative stress had returned to baseline levels in the normal-weight individuals, but it continued to climb in the obese individuals. The same pattern was seen for inflammation. In another study, Dandona and his colleagues demonstrated that a high-fruit, high-fiber meal with the same calorie content as the fast food meal tested in the current study produced no increase in oxidative or inflammatory stress. The findings provide yet more evidence that people should avoid high-fat, high carb fast food meals and consume as much fruit and vegetables as possible, Dandona said. 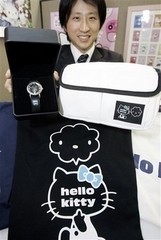 The cute cuddly white cat from Japan’s Sanrio Co., usually seen on toys and jewelry for girls and young women, will soon don T-shirts, bags, watches and other products targeting young men, company spokesman Kazuo Tohmatsu said Friday. The usual bubble-headed shape of Hello Kitty was slightly changed for a more rugged, cool look to appeal to men in their teens and early 20s. For example, a picture of the cat on a $36 black T-shirt has the words, “hello kitty,” instead of the usual dots for the eyes and nose. Hello Kitty is one of mascot-obsessed Japan’s biggest “character” hits, decorating everything from a humble eraser to a $48,000 diamond necklace. Nevertheless, Harris said, he would encourage people to eat fish rather than relying on fish oil capsules. “Fish of course brings with it proteins and minerals and other factors that are good for our health that the capsules don’t bring, but we weren’t able to measure any of those things,” he said. When we think of statues and buildings of the classical period, we tend to imagine white marble; scientists in recent years have discovered that it is in fact most likely that many of the buildings and statues were painted and probably adorned with jewelry. 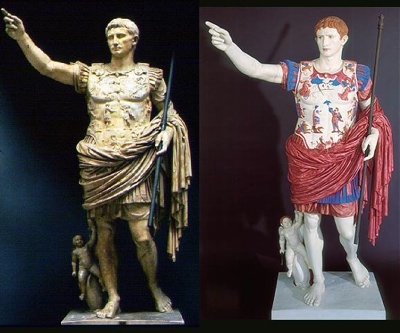 The Vatican Museum has recently put on an exhibition of some of the most famous antiquities from the era with reproductions painted as close to the originals as they can – this is possible because many statues contain trace amounts of pigment from their original coats of paint. The study, published in the Dec. 26 edition of The Journal of Neuroscience , found orexin A not only restored monkeys’ cognitive abilities but made their brains look “awake” in PET scans. Siegel said that orexin A is unique in that it only had an impact on sleepy monkeys, not alert ones, and that it is “specific in reversing the effects of sleepiness” without other impacts on the brain. Such a product could be widely desired by the more than 70 percent of Americans who the National Sleep Foundation estimates get less than the generally recommended eight hours of sleep per night (.pdf). The research follows the discovery by Siegel that the absence of orexin A appears to cause narcolepsy. That finding pointed to a major role for the peptide’s absence in causing sleepiness. It stood to reason that if the deficit of orexin A makes people sleepy, adding it back into the brain would reduce the effects, said Siegel. McDonald’s exemplifies the role of small businesses in Americans’ upward mobility. The company is largely a confederation of small businesses: 85 percent of its U.S. restaurants — average annual sales, $2.2 million — are owned by franchisees. McDonald’s has made more millionaires, and especially black and Hispanic millionaires, than any other economic entity ever, anywhere. McDonald’s has 14,000 restaurants in America and an additional 17,000 in 117 other countries. The company will add 1,000 others in 2008, more than 90 percent of them abroad. Such is the power of the McDonald’s brand, 48 percent of the people of India were aware of McDonald’s before it opened its first restaurant on the subcontinent. In the race to make computers faster, chipmakers rely on exotic new materials. In January, Intel announced that the element hafnium and some new metal alloys will allow them to make the millions of switches on their microprocessors far smaller. Gordon Moore, co-founder of the company and father of the law that bears his name, called it the biggest change in transistor technology since the 1960s. The tremendous accomplishment allows Intel to squeeze features on each chip down to 45 nanometers from the current standard of 65 nanometers. But the greatest benefit may be an increase in energy efficiency. That improvement comes along with the hafnium alloys that will prevent electricity from leaking across the tiny switches. Intel started using the technology, codenamed Penryn, in November in high-end servers. Home users can expect the chips in early 2008. At Oregon Health and Science University, Shoukhrat Mitalipov and his team cloned a Rhesus Monkey and used the resulting embryo to create stem cells. Until then, the impressive feat had been performed only with mice. In November, the team reported in Nature a surprising key to their success: avoiding ultraviolet light and dyes — tools that are almost always used in cloning experiments — because they can damage delicate cells. Stem cells could be used to repair nearly any damaged organ, but they are useless if they upset the immune system. By cloning sick patients and using cells derived from their own bodies, doctors could skirt problems similar to those experienced by people with organ transplants. But some say the No. 1 discovery on our list makes cloning unnecessary. Nonetheless, some scientists, including stem-cell researchers at Harvard, say cloning is still necessary. Ordinary seasonal flu vaccines may provide a small amount of protection against bird flu, Italian researchers reported on Wednesday. Their study is among the first to support the idea that getting an annual flu shot may help people’s bodies fight off the H5N1 virus, which has killed 210 people in 13 countries and infected 341. Cristiana Gioia, Maria Capobianchi and colleagues at the National Institute for Infectious Diseases Lazzaro Spallanzani in Rome tested the blood of 42 volunteers who had been vaccinated against seasonal influenza. In the laboratory, they added H5N1 virus to the blood and found that in some of the volunteers immune system proteins called antibodies acted against the bird flu virus. They also found a few immune cells called CD4 T-cells seemed to recognize and act against H5N1 virus “and seasonal vaccine administration enhanced the frequency of such reactive CD4 T-cells,” they wrote in the journal Emerging Infectious Diseases. “Our findings indicate that seasonal vaccination can raise neutralizing immunity against (H5N1 avian influenza) virus,” the researchers concluded. This could help explain why H5N1, which only rarely affects people, is even rarer among the elderly, Gioia’s team wrote. “This finding may be explained by hypothesizing that older people, although not previously exposed to H5N1 subtype, may have gained protective immunity by previous infections sustained by circulating influenza virus strains,” they wrote.